Educators and researchers share their views on why authentic assessment is a critical piece of the learning process. Bruce Alberts is Professor Emeritus in the Department of Biochemistry and Biophysics at the University of California, San Francisco, and former president of the National Academy of Sciences (NAS). During his twelve-year tenure at NAS, he played a key part in developing the National Science Education standards that are now used in schools across the country. What steps would you propose at the state and national level to better understand the strengths and weaknesses of the standardized tests currently administered to K-12 students throughout the country? "Right now we have examples, I think, of some tests that do the right thing. I would think that the state of Maryland's assessment -- which is basically problem oriented, performance oriented, and graded by teachers in schools -- is driving the right kind of teaching, and is having a good effect on learning. But, the sad part of all this, is that we haven't put enough resources into what I would call scientific research on education to find out whether the Maryland test is really working." "And so I would very much like the academy or somebody -- because somebody's got to do this -- to take advantage of the fact that we have all these states doing different experiments and take, for example, three or four states with very different assessments for science, Maryland would be one, and then actually do some research on what's the effect of teaching and learning of these different kinds of tests." "We've done these large-scale experiments, but nobody's evaluating them. Part of the reason nobody's evaluating is because the federal government doesn't like to do that kind of thing. Senators and governors don't like to be compared. But, in the private sector, at least, we should be able to do those kinds of comparisons so we could take advantage of the fact that we don't have a national system." "We're doing all of these experiments, and, in principle, we could create a continuously improving system by studying the experiments. But if we're doing experiments and nobody's evaluating, and everybody's claiming success, and every state thinks they have a good system, then of course, we're never going to get anywhere with education in United States." Read the full Edutopia.org interview with Bruce Alberts. Paul Curtis is director of school quality for New Tech Network, a national organization that works with communities to develop innovative public high schools. The New Tech model emphasizes project-based learning, a school culture that empowers students and teachers, and the integration of technology into the classroom. During his teaching career, Curtis helped to define the curriculum model and assessment practices at the flagship New Tech High, in Napa, California. How does the New Tech approach differ from more traditional assessment? "Traditional assessment tends to oversimplify the data. If a student turns in a major research paper a few days late, it gets graded down -- 10 points a day or whatever the penalty may be. Let’s say it’s a B+ paper but, because he turned it in late, the student receives a C-. When you put C- into the grade book, you’ve lost all meaningful data about the student’s skills or abilities. The grade doesn’t tell you if the essay was poorly written, had poor content, or was just late. In the same way, overall course grades don’t tell us enough about the skills and abilities of a student. They don’t show us how we can intervene and help that student." "At New Tech, we give an assignment multiple grades, all scored separately in our grade book using rubric-based assessments. A teacher might assess the understanding of content, how well the assignment was written, the critical thinking that was involved, and also the student’s work ethic. Rather than seeing grade-book categories such as tests, homework, and papers, students see categories such as oral communication, work ethic, written communication, collaboration, critical thinking. 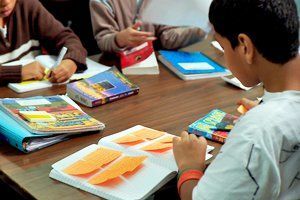 When you look at students’ grades, you can quickly tell if they’re working hard (by the work-ethic grades), or if they’re struggling with content and need resources or differentiation." "I like to share a story about a student who was leading a campus tour. An adult visitor asked why she had volunteered to conduct the tour. She said, “My oral presentation scores are low, and I know I need to practice. This is a good opportunity for me to practice speaking in front of people.” There’s a metacognitive awareness that these skills are important, across classes and for life. Rather than avoiding the things they’re not good at, students tend to seek out opportunities to improve those skills." How does this approach change conversations with parents? "When we sit down with parents and students, we can look at grades together and get an assessment of the relative strengths and weaknesses of a student. This changes the entire dialogue. It’s a richer conversation. Once we recognize students’ weak areas, we can work together to improve them." What helps teachers get comfortable using this approach to assessment? "Our approach involves massive, holistic systems change. It’s not a piecemeal approach. It’s not just changing how we give grades. It’s also project-based learning, technology integration, longer class periods -- everything. We’ve changed the rules. If we’re going to assess teamwork and critical thinking, we need to give students opportunities to develop these skills. Teachers have to create assessment systems that define what these skills mean and then provide regular opportunities for students to demonstrate them. It’s a matter of getting everyone comfortable in this new system." What does formative assessment look like in this model? "During a project, you’ll see students doing different things. Some will be working with their team. One might be doing research individually. A small group might be working with the teacher on a mini-lesson. A typical class might start with a quiz, a quick journal write, or some other way for the teacher to check in on where kids are. Students who need help on the content or skill that was just assessed will then work with the teacher on a mini-lesson or workshop. Some teachers leave space on the whiteboard for students to request a workshop on something they’re struggling with. It might be related to content, or it might have to do with how to work better with their team members. We want kids to find their own path to knowledge, one of which is through the teacher." How does assessment help students manage their own learning? "We encourage the concept of the lifelong learner. The Web has made the traditional classroom obsolete; school’s not the only place you can learn. We’re teaching students to have ownership over their learning, to be self-advocates. One of our graduates came back and told us about his college physics class. On the first day, his professor said that half the students would fail the course. The New Tech student looked around for four or five others who seemed engaged, and they formed a study group. Those kinds of skills will allow you to be successful in this ever-changing world." Read an Edutopia.org article about assessment at New Tech High School: "Accurate Assessment: Grades That Mean Something". Linda Darling-Hammond is the Charles E. Ducommun Professor of Teaching and Teacher Education at Stanford University, where she has launched the Stanford Educational Leadership Institute and the School Redesign Network. She has also served as faculty sponsor for the Stanford Teacher Education Program. Darling-Hammond is a former president of the American Educational Research Association and a member of the National Academy of Education. "In the United States, now we’re talking a lot about international competition, internationally benchmarked standards and so on. So, I’ve looked at a lot of high-achieving countries around the world to see what they do to create a strong teaching and learning system. It became very clear to me right away that the issue is not just the standards that are written on paper. It’s the entire system that is created in high-achieving countries like Finland and Singapore, Australia, Canada, Hong Kong and others, that is very different from what we have in the United States." "What you see in high achieving countries is typically a very lean set of standards. In Finland or Japan, for example, all of the math standards can fit in about ten pages from K-12. They are very clear about what needs to be taught and when and how it builds over time. But they’re not overly prescriptive. They have school-based assessments as well as external assessments that are brought together in the accountability system that include things like research and inquiry, scientific investigations, extensive writing. Most of these countries do not use multiple choice testing to any great degree. Some don’t use it at all. Kids are always having to write, analyze, explain their views, produce data, analyze data on a regular basis -- both in the classroom and on the assessments." "By comparison, in the United States, we do have standards and many states have created good standards. Many states, however, have not attached curriculum to the standards. So, they’ve gone straight to tests. In some states, the standards are sort of a mile wide and an inch deep. There are 300 things to cover in each grade level, not a small number of things to do well and deeply. And the content coverage of large numbers of objectives superficially means that we end up re-teaching the same thing over and over again, year after year because we didn’t stop and do it well and deeply at a moment in time. So, our kids study fractions in third grade and then again in fourth grade and fifth grade. Many of them don’t get it." "Whereas, if we spent, as many countries do, a quarter of a year on a single topic, working on it deeply, you could then understand it deeply enough to move forward. I think this accounts, in part, for the low achievement that we see in this country relative to other countries." "I think if we don’t make all of the changes that are necessary to create a forward looking teaching and learning system, we’re going to find that we continue to fall further and further behind other countries -- in the international assessments, but also in the world, around education and eventually the economy itself." Watch the full Edutopia.org interview with Linda Darling-Hammond. Larry Rosenstock is CEO and founding principal of High Tech High, a network of eleven K-12 public charter schools in California, and is Dean of the High Tech High Graduate School of Education. Larry taught carpentry in urban high schools in Boston and Cambridge and was principal of the Rindge School of Technical Arts, and of the Cambridge Rindge and Latin School. He was also a lecturer at the Harvard Graduate School of Education. "Legislative bodies feel that they need to have transparency for how their public dollars are being spent. That’s to be expected. Unfortunately, standardized tests only cost one dollar a copy to grade, so they rely, not surprisingly, on the least expensive and least sophisticated method of getting transparency. We get transparency by having students get up and present their work repeatedly and formally with live audiences. We get transparency by having glass all over the place, so you can see what everyone’s doing, and having three thousand people come in every year to visit. The problem with standardized tests is that there’s an over-reliance on them. There’s an assumption. I think the medical community understands that the more times you take the patient’s temperature -- they don’t get better by more frequent temperature takings. My remedy to the fallacy of standardized tests is a very simple one (that probably won’t happen). Give Congress the ninth grade Stanford 9, and make the results public, and the discourse on standardized testing will change in a day." "There are many benefits to having kids present their work publicly. A principal one is that a child learns from experience, and they are no longer shy about doing it. I tell our visitors who come here, 'Stop any child that you want, grade six through twelve, at random, and ask them what they’re working on and watch what happens. They’ll look you in the eye and they’ll talk to you about what they’re working on.' It’s another way of getting at the transparency of recognizing whether they’re doing work that’s worth doing, and whether they’re learning things that are worth learning. If we are watching these presentations of learning and we see a really good one, and then we see a not so good one, then we all -- new teachers, new students, and the rest of us -- say, 'That was a really good one. That one wasn’t so good. Next cycle, mine’s going to be more like that one and less like that one.' It’s not about judging, looking backwards. It’s about correcting forward, and having built a mechanism into a school where you have a cycle of improvement, so the quality of work can become of better and more lasting value than yesterday." Watch the full Edutopia.org interview with Larry Rosenstock. Grant Wiggins is a nationally recognized assessment expert who has been working in assessment reform for more than twenty-five years. He is president of the educational consulting firm Authentic Education, and with Jay McTighe, co-author of Understanding by Design, an award-winning framework for curriculum design used around the world. What distinctions do you make between "testing" and "assessment"? "Our line of argument is that testing is a small part of assessment. It needs to be part of the picture. Many people who are anti-testing end up sounding anti-evaluation and anti-measurement. A good test has a role to play. The language that we like to use is, it's an audit. It's a snapshot. You don't run your business for the audit. You want more than a snapshot, you want a whole family album. But the audit and the snapshot have a place in the larger picture." "What can the test do that more complex, performance-based, project-based things can't do? Look for discrete knowledge and skill for the individual student. Many projects, because they're so collaborative, end up making you wonder, well, what about the individual student? What does the individual student know?" "For instance, in some state-based, performance-based assessment, they always had a parallel paper-and-pencil test for the individual student so that you had enough data on the individual. A different way to say it -- and this is what scientists and researchers say -- is triangulate the information. Match the quiz against the project, against the PowerPoint® presentation. Now what's the whole picture say? So, what we would say is "testing" is one piece of a portfolio." "One of the challenges in teaching is designing, and to be a good designer you have to think about what you're trying to accomplish and craft a combination of the content and the instructional methods, but also the assessment. And one of the things that we've done over the past years in working with teachers is share with them how important it is to say, "What are you going to assess? What's evidence of the goals that you have in mind?" Otherwise your teaching can end up being hit-or-miss." "We call it backward design. Instead of jumping to the activities -- '"Oh, I could have kids do this, oh, that'd be cool" -- you say, "Well, wait a minute." Before you decide exactly what you're going to do with them, if you achieve your objective, what does it look like? What's the evidence that they got it? What's the evidence that they can now do it, whatever the "it" is? So you have to think about how it's going to end up, what it's going to look like. And then that ripples back into your design, what activities will get you there. What teaching moves will get you there?" Read the full Edutopia.org interview with Grant Wiggins. George Wood has had a distinguished 30-year career in public education, serving as teacher, principal, school board member, and education professor. He is currently principal of Federal Hocking High School in Stewart, Ohio. He is also president of the executive board of the Coalition of Essential Schools and executive director of the Forum for Education and Democracy. Wood is the author of Time to Learn and Schools That Work: America’s Most Innovative Public Education Programs. Why do schools need better ways of assessing student learning? "As an educator, parent, and community member, I’ve always been interested in what people can do. Unfortunately, much of school is about what people claim they can do as measured by paper-and-pencil tests. We are misled in terms of our understanding about what people learn because we use the wrong measures." "For example, I like to fly-fish. I’ve worked hard to get relatively proficient, but I’m still learning. If you asked me how to make a Parachute Adams #18 dry fly, I could describe all the steps and fill in the right bubbles on a test. But my Parachute Adams would not look the way it should. And if you asked me to take what I know and go catch a fish, I probably couldn’t do it. I have a long ways to go before anyone would consider me an expert." "In education, our most important task is to prepare young people to be engaged and active democratic citizens. I will wager that most students in this country can tell you something about the Bill of Rights. But try asking them, “So how could you exercise your First Amendment right of freedom of speech?” Most will have no idea. In the end, it’s about what you can do -- not what you can spout off. That’s why we have to get at different ways of assessing what kids know." What does authentic assessment look like in practice? "At the end of each semester, our teachers engage students in extensive, half-day performances of what they have learned. In physical education, for example, our students spend the first part of the period using a website to determine their metabolic levels and basic data. Then they select a candy bar from their teacher’s desk. Now, here’s the kicker: The teacher asks them to design and then perform a 60-minute exercise program, based on what they have learned that semester, that will work off the candy bar’s calories." "Students should be able to demonstrate their knowledge through application. That’s the ticket." What about assessment that happens in less formal ways? "Assessment is not just about what students have learned. It’s also about them understanding their own limitations and recognizing what else they need to learn. That’s how musicians, artists, and actors get better at their craft. Their work is critiqued, and then they understand what they need to work on to improve. Assessment helps us learn more." What can school leaders do to encourage a more comprehensive approach to assessment? "We have to rethink the overall organization of school. How can we give teachers more planning time, more opportunities to collaborate? How can we build professional-development opportunities and expertise within the school staff? At our school, we have ongoing conversations about exit skills, student portfolios, schedules. Last year, we changed our end-of-semester exams so that they last for half a day. Now, teachers have enough time to do high-quality performance assessments. And these assessments count -- big time." "Visiting schools that work this way is crucial; you just have to go see it. Then, you have to plan backwards to figure out the steps needed to make it happen at your school."